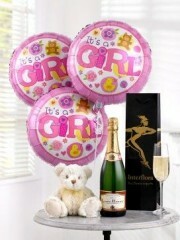 Help to celebrate their wonderful new arrival with some fine champagne for Mum and Dad, a beautiful teddy bear for her, and some big, helium-filled balloons for everyone to enjoy. After all, this is a very special occasion and deserves a very special gift. 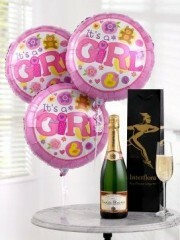 A new baby is always a reason to celebrate, and Ellon Flowers is fully stocked and prepared to help you to do just that. Our fantastic selection of flowers and gifts for a new baby girl means that there is no need to look any further than the florists in Ellon to provide anything you might need. 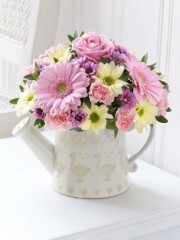 We are confident that we have great range which means that you can easily find something to suit a variety of tastes. Our team of florists in Ellon have over 40 years of experience in the floristry industry, so your special gift is in careful and skilled hands. 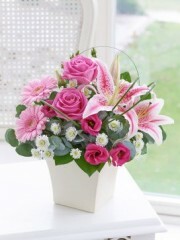 Our florists are also happy to advise you throughout your order and purchase concerning your meaningful new baby girl gift. Our business is able to provide a great flower delivery service throughout Ellon and the local area, even offering same day delivery if your order is placed before 3pm. However, our delivery service doesn’t end there. 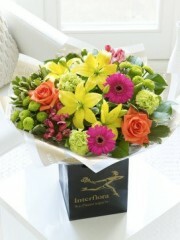 We are part of the Interflora brand, which means we are able to deliver your baby girl gift to a huge range of locations across the United Kingdom. But we aren’t limited to the United Kingdom either! By ordering your baby girl gift at Flowers Ellon you can also choose to have your gift delivered overseas, as we deliver internationally in 140 different countries across the world. 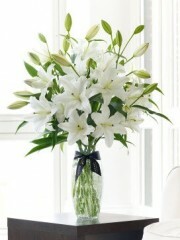 The message which flowers send has no boundaries, which is why we are not limited to any location. 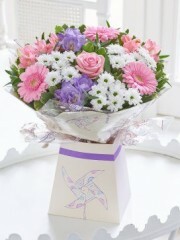 Ordering in Ellon Flowers is simply the first step to delivering a special baby girl gift wherever you may want. 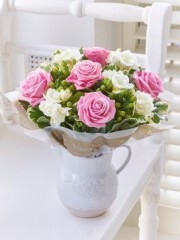 Our expert team at Flowers Ellon will carefully oversee your order throughout its complete journey, until it is safely delivered to your recipient’s door. Trusting the florists in Ellon to provide you with a beautiful new baby girl gift is a wonderful decision that you will never regret. As mentioned, our beautiful gifts for an equally beautiful baby girl are a perfect choice for you to send a meaningful and heartfelt message. Ellon Flowers know that flowers have always been a sure way of sending a sincere message to those you love, and a new baby girl and her parents definitely deserve a sign that you’re thinking of them. 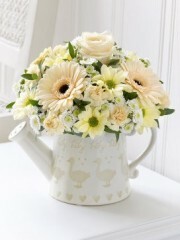 Our florists in Ellon are delighted that we can offer you such a wide range of baby girl gifts as well as a highly efficient flower delivery service. Amongst our selection of gifts you can choose from luxury hand tied bouquets of the freshest flowers, bouquets accompanied by a celebratory balloon or box of chocolates and of course a personalised message if you so wish. Amongst our creative gift ideas are our celebratory baby girl gift basket, a luxury white oriental lily vase and baby girl gift bags. All of these splendid gift baskets have been lovingly made by our Ellon florists to send a new baby girl all the care and attention she deserves. Here at Ellon Flowers we care about delivering not only a gift but also a smile to people’s faces, which is why we are the obvious choice for all of your flower gift needs. We recognise that flowers are a beautiful and meaningful gift, and we believe that something as personal as this should be as easy as possible for the customer. 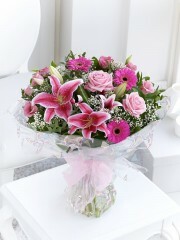 This is why ordering a baby girl gift from Ellon Flowers today is an easy way to guarantee utmost satisfaction.